60 Minutes on: "The Dirty Dozen"
"I only do what I'm called upon to do," says a redneck, Bible-quoting racist, charmingly named Arthur Maggott (Telly Savalas), in the opening section of "The Dirty Dozen." As goes Maggott, so goes the suicide squad assembled by Maj. Reisman (the incomparable Lee Marvin, one of his best roles) to parachute behind enemy lines and destroy a chalet full of German officers on the eve of the D-Day invasion. All twelve of the titular characters (thirteen if you count Reisman; fourteen if you include Reisman's right-hand man Sgt. Bowren, played by Richard Jaeckel) are just doing what they're called upon to do. That's different from doing what a man's gotta do, as in Westerns; you may "gotta" do it on some primordial level, thanks to conditioning, but ultimately you have a choice. Soldiers don't—at least not in quite the same way, or with quite the same latitude as a gunslinger in a Western. As Reisman explains to the squad on more than one occasion, they have to accept this mission and carry it out successfully because they're all either on death row or sentenced to two or three decades in military prison. If they intentionally foul things up or try to escape, they'll end up back in a cell, swinging from a noose, or rotting in a field somewhere. What the so-called Dirty Dozen are dealing with is just a more extreme version of what Reisman has to deal with every day as a smart and smart-alecky officer in This Man's Army, but when worse comes to worse, he still follows orders. You hear the voices and you do as you're told. Naturally, and perhaps thankfully, "The Dirty Dozen" isn't the kind of movie that peacocks its world view in a collegiate sort of way. The film's direction, by Robert Aldrich, and the screenplay, credited to Nunnally Johnson and Lukas Heller (from E.M. Nathanson's novel), are functional and hard-hitting. The feeling of claustrophobia, indeed of being trapped or incarcerated, extends to the viewer as well, thanks to Aldrich and cinematographer Edward Scaife's use of ominous panopticon-styled overhead shots (often peering down into rooms, as if through an invisible ceiling) and in closeups taken with a telephoto lens, which makes foreground objects loom menacingly, and slices the screen into sections as prison bars might. This approach carries all the way through to the movie's final scene, which finds Bronson and Marvin's characters recuperating in a military hospital after their mission. The camera either gazes down on them from above, like a curious but disinterested god, or peers upward through the bars of the hospital beds' metal headboard/grilles. This is one of the most aggressively visual/thematic motifs in any Aldrich film, by the way; the director otherwise tended to be more of a "just get it done" kind of guy, in the spirit of Samuel Fuller, worrying more about the tone and overall momentum of the tale than making every shot sing. If you come into the film cold, having heard it described for years as a great action film, you might be surprised by how long it takes for anyone to die; the final assault takes up approximately the last 40 minutes of this nearly two-and-a-half hour film, a figurative and then literal bang set off by a long fuse. There are fisticuffs, shouting matches, and war-games shenanigans of a sort that prefigured 1970's influential "MASH" (which co-starred Sutherland, who got cast because Robert Altman enjoyed the scene where he pretends to be a general). The "action," as modern film fans might conceive it, doesn't ramp up until the sequence where the Dozen embarrass Robert Ryan's supercilious commanding officer by hatching an elaborate fake-out that ends with them sneaking into his command tent. Much of the movie consists of scenes where Reisman gets to know his scary, slimy or taciturn recruits and then figures out how to push their buttons and trick or cajole them into working together. It's hard to imagine modern audiences sitting still for a movie like this if it had been advertised as an action picture. Modern action movies are all motion, often wasted motion that doesn't have any bearing on the story, and much of that tends to be diced into two-second chunks and amped up by deafening sound effects, which is what directors do when they can't actually direct. 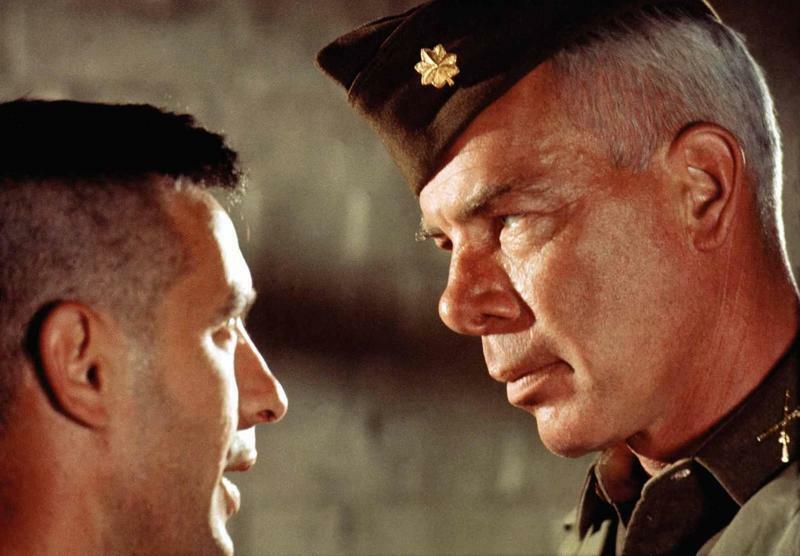 Probably three quarters of "The Dirty Dozen" is built around closeups and two-shots of craggy-faced actors talking, often softly. One of the most exciting scenes in the film consists of Charles Bronson trying to throw a grappling hook onto a roof. Yet the low-level tension that persists throughout the tale is still gripping, albeit in an anxiety-producing, often sour way, because the major characters are all so hard or mean, and because the entire contraption builds to a nihilistic sting. Those who saw a veiled critique of the United States' grandiose, deluded self-image weren't imagining things. Between the casually callous treatment of the wronged and noble Jefferson, Reisman's determination to bring Franko to heel, and the images of US soldiers herding Germans into a makeshift oven and burning them to death, the movie might as well have been called We're No Better Than the Nazis. (Walker's character might have added another layer to this if he'd been played as written, as a Native American.) Quentin Tarantino's "Inglourious Basterds" steals liberally from this movie, and not just in the squad-of-misfits subplot starring Brad Pitt. The Auschwitz-roasting of the German officers and their wives anticipates the fire in the theater at the end of "Basterds," and the image of a righteous black man warring against the antebellum South got a workout in two Tarantino pictures, "Django Unchained" and "The Hateful Eight." It would be ahistorical, though, and maybe silly, to see this film as left-wing propaganda. The men who made this movie were culturally conservative, and a good number of them had served in World War II, including Ryan, Savalas, Bronson, Borgnine, Walker, and Marvin, who was a Marine in the Pacific theater and survived being shot by Japanese soldiers on two occasions. "Life is a violent situation," he told an interviewer after "The Dirty Dozen" came out, defending the film's depiction of a violent, cruel world full of people who seem determined to do unto others before others can do unto them. "It's not just the men in the chalet who were Nazis; the women were part of it, too. I liked the idea of the final scene because it was their job to destroy the whole group and maybe in some way speed up the demise of the Third Reich. We glorify the 8th Air Force for bombing cities where they killed 100,000 people in one night, but remember, there were a lot of women and children burned up in those raids." The Unloved, Part 34: "The Lords of Salem"